Danieli is the lead author of one of the new studies, Still Missing Dark Matter: KCWI High-resolution Stellar Kinematics of NGC1052-DF2 . It confirms the team’s initial observations of DF2, using more precise measurements from the W.M. Keck Observatory’s Keck Cosmic Web Imager. The researchers found that the stars inside the galaxy are moving at a speed consistent with the mass of the galaxy’s normal matter. If there were dark matter in DF2, the stars would be moving much faster. Van Dokkum is lead author of the other new study, A Second Galaxy Missing Dark Matter in the NGC 1052 Group which details the discovery of a second galaxy devoid of dark matter. That galaxy is named DF4. A galaxy’s halo is not a clump of dark matter traveling with the galaxy. A galaxy’s halo is displaced supersolid dark matter. 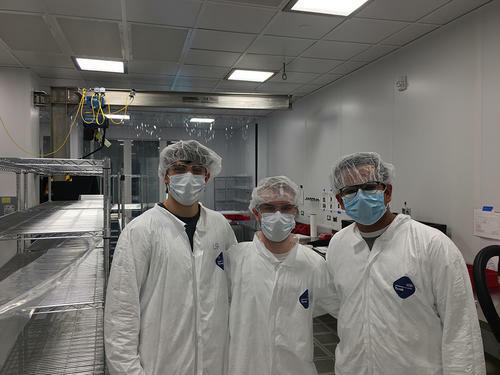 A team from the Yale Undergraduate Aerospace Association (YUAA) that is currently in residence at Wright Lab to build a CubeSat research satellite to detect cosmic rays has been chosen by NASA as one of 16 teams across the country whose CubeSats will be flown into space as auxiliary payloads on space missions planned to launch in 2020, 2021 and 2022. It will be the first ever Yale undergraduate endeavor to launch a spacecraft, forging the path for even more ambitious space-based projects by Yale undergraduates in the future. This semester, the YUAA team is transitioning from R&D and preparation work to prototyping and final construction work on the satellite. In January 2019, the team began using one of Wright Lab’s clean rooms to conduct tests on launch-ready components, such as the altitude control systems. The team will also use the facility for final assembly of the satellite. In addition, the Wright Lab community is available to the team for advice and guidance about the project during their residency here. The YUAA CubeSat project is an undergraduate-run project, currently in its 4th year. Led in previous years by Betsy Li ’18, Michael van der Linden ’19, and Kathan Roberts ’20, the project is currently led by Keshav Raghavan ’21. The team is receiving extra guidance and assistance from Senior Engineers Milo Brandt and YUAA co-president Andrew Krzywosz. Project Seconds are Claire Laffan ’21 (Alpha/Beta Detector Payload), Michael Linden ’21 (Power and Solar Systems), Annie Polish ’21 (Radio Communications), Wright Lab undergraduate Lukas Baker ’21 (Mechanical Design; Sensing and Control), and Jackson Petty ’21 (Computer Systems and Programming). Senior research scientist and CEID Design Mentor Larry Wilen serves as the faculty mentor for the project as a whole and Wright Lab Associate Director for Instrumentation and Education James Nikkel is providing additional mentorship to the team at Wright Lab. Enshrined by the laws of Austrian physicists Josef Stefan and Ludwig Boltzmann in the late 19th Century, scientists have long understood the general principles of heat-energy transfer between the sun and planet Earth. But at much closer separations, where photons can effectively “tunnel” between two bodies, the maximum rate and size at which two objects – one hot, one cold – can transfer heat has remained unknown. From their emerging field of near-field nanophotonics, a group of Yale scientists have taken a new step in advancing the ‘Stefan-Boltzmann law’ by creating a mathematical framework to identify the upper bounds of light interactions and radiative energy transfer. Their findings could open the way for brighter imaging techniques, improved solar-power technologies, and the efficient conversion of heat to electricity. Writing in the journal Physical Review X, scholars at the Yale Energy Sciences Institute set out to answer fundamental questions: how bright can the radiation from a single molecule be? How quickly can a hot body cool off? And what materials should one choose to maximize these effects? To understand spontaneous emissions in the “near field,” where radiating sources are close to structured materials, graduate student Hyungki Shim developed mathematical techniques to strip away the complex dynamics in these large design spaces, revealing instead the key physical principles constraining optical response. Alongside summer student Lingling Fan, MIT professor Steven Johnson, and the study’s senior author Owen Miller, an assistant professor in the Department of Applied Physics, the scholars developed the first singular metric to measure light interactions. In the race to discover new two dimensional materials to power technology innovations, this “new global optimum” is expected to help scientists understand the potential for light-matter interaction for any material, unlocking the future development of promising practical applications. The Engineers Without Borders-Yale team helps local officials in Naitolia, Tanzania survey the top of existing embankment dam. Left to right: Erasto, Tula Ngasala, Ndesa, a Naitolia official, Annabelle Pan, and Patrick Hong. Yale University continuously leverages the power of partnerships and global networks to solve problems around the world. The work of the Yale chapter of Engineers Without Borders USA (EWB-Yale) is a perfect example of how such an approach can create and foster a shared future with the global community, according to Dave Sacco ’81, a civil engineer who has served as EWB-Yale’s professional mentor since the club formed more than 15 years ago. Durga Thakral ’12, a former EWB-Yale member, agrees with Sacco, citing her time working for the organization as the most life-changing experience of her undergraduate education. A registered undergraduate organization, EWB-Yale is one of about 300 university and professional chapters that comprise Engineers Without Borders USA, a non-profit humanitarian organization established to partner with developing communities worldwide to improve their quality of life. Work by EWB organizations involves the implementation of sustainable engineering projects while involving and training internationally responsible engineers and engineering students. Annabelle Pan and Dave Sacco test soil compaction. Work conducted by EWB-Yale is funded by private donations, grants from corporate and NGO partners, and in-kind contributions from the communities in which Yale-EWB teams work. The organization originally began in 2003 by a group of undergraduates with the support of Bill Mitch, then an assistant professor of chemical and environmental engineering at Yale. It is comprised of numerous students from a wide variety of academic backgrounds, as well a professional mentor and a Yale faculty adviser. Since its establishment, EWB-Yale has engaged in close partnership with local communities, NGOs, university students, and other stakeholder groups to build the infrastructure necessary to create, repair, or expand clean, reliable water supplies in four different communities. It tackled its very first project in 2005-2006 in Honduras. where the group repaired an existing water system for the town of El Rosario. In 2007 the organization started working in Africa, spearheading an award-winning project in northwest Cameroon to create a water distribution system in the village of Kikoo, and later a similar distribution system in the neighboring village of Rohvitangitaa. “The intimate trust we’ve built with the community and the communication with local leaders arising from it allows us to execute a truly sustainable and effective project tailored to our partners’ actual needs, rather than just our preconceptions,” said Katrina White ’20, former EWB-Yale co-president and a contributing member of the organization since 2016. According to Jordan Peccia, the Thomas E. Golden Jr. professor of Chemical and Environmental Engineering and faculty adviser for EWB-Yale, the organization always takes an extremely collaborative approach when engaging in projects. Before project work even begins the organization reaches out to host country universities to generate interest and recruit local undergraduate students to its projects, where they work alongside Yale students. Annabelle Pan ’20, recent student co-president of EWB-Yale, said she believes maintaining a close relationship with the local community even after the project is completed to be vitally important. Surveying the slope of the watershed. Left to right: Madison (Maddy) Shankle (Yale Undergrad), Annabelle Pan, Ndesa. The Naitolia project Pan references is the most recent project taken on by EWB-Yale that entails restoration of water infrastructure for the community of Naitolia in the Arusha region of Tanzania. In 1982 the citizens of Naitolia built a small embankment dam to capture seasonal rainfall that is stored for livestock use during the dry season. Unfortunately, in recent years, erosion severely damaged the embankment eventually causing a breach that rendered the pond unusable. Beginning in 2017 EWB-Yale has led a project to assess, restore, and strengthen the pond as a water source. Looking at GPS images of the pond watershed. Left to right: Mr. Shafuri (Mondouli District), Tula Ngasala (TPP), Naitolia officials, and Dave Sacco. In taking on projects, EWB-Yale makes a minimum five-year commitment. The group started the Naitolia project in 2017 and are committed to working with the community through 2022. To date, the pond is mostly constructed and is expected to fill during the fall and upcoming spring rainy seasons. This year the EWB-Yale team will assess how the pond is operating, continue excavating to expand the storage capacity and begin to assess the community’s well-fed water supply to identify ways to improve its output, reach, and reliability. The chapter will periodically conduct community meetings and household surveys within Naitolia to ensure that construction of the pond is providing appropriate health, educational, and economic benefits. Outreach and education efforts will focus on encouraging increased use of higher quality water supplies for human consumption while the pond provided an expanded water supply for livestock use. Yale undergraduate or graduate students interested in joining EWB-Yale (note: being an engineering student is not required) can visit the organization’s website, or contact Dave Sacco at dsacco@tpadesigngroup.com or Jordan Peccia at Jordan.peccia@yale.edu. The study was funded in part by NASA and the National Science Foundation. The Howard Hughes Medical Institute (HHMI) has named Marla Geha, professor of astronomy and physics, as one of its new HHMI Professors chosen for their extraordinary teaching, inspiration, and mentoring of the next generation of science students. Geha will receive $1 million over the next five years to make the science portion of the Warrior-Scholar Project for military veterans on the Yale campus a model for other Warrior-Scholar Project programs around the country. Geha has been active in the Warrior-Scholar Project for five years as an instructor and advisor. The Warrior-Scholar Project offers two-week college preparatory boot camps on university campuses, aimed at giving enlisted veterans the skills and confidence needed to succeed in college. The boot camps are led by enlisted veterans who already have made a successful transition into college, in collaboration with faculty and students from each host institution. Yale alumni Christopher Howell ’14, Jesse Reising ’11, and Nick Rugoff ’11 founded the Warrior-Scholar Project in 2012 at Yale. Initially the program focused on reading and writing skills. In 2016, Geha designed a science boot camp and successfully oversaw a pilot course at Yale. Geha proposes to “franchise” the science curriculum for universities across the United States, create a research fellowship program for Warrior-Scholar science alumni, and strengthen the community of Warrior-Scholar scientists by improving online alumni resources and organizing a biennial alumni conference. In her astrophysics research, Geha uses the world’s largest telescopes to study the smallest galaxies in the universe. Her work is focused on the least luminous known galaxies, studying how these galaxies formed and using them to understand the nature of dark matter and the underlying cosmology of the universe. Geha also is one of the lead members of the Satellites Around Galactic Analogs (SAGA) Survey, a project that will study satellite galaxies around 100 Milky Way “sibling” galaxies. Geha arrived at Yale in 2008 and has been a full professor since 2014. She earned a B.S. in applied and engineering physics from Cornell University and her PhD in astronomy and astrophysics from the University of California-Santa Cruz. Geha has received a number of honors, including Popular Science magazine’s Brilliant 10 young scientists in the country (2009), an Alfred P. Sloan Research Fellowship (2010), and a John S. Guggenheim Fellowship (2015). The HHMI Professors Program provides grants to faculty members of leading research universities in the United States whose primary research and scholarship is aimed at advancing scientific discovery in the laboratory or the field. The program seeks to develop models for how scientists can engage in undergraduate education. HHMI created the program in 2002. In the last 15 years, 55 scientists have been appointed HHMI professors and have received grants to foster innovations in undergraduate science education. In a new study, a Yale-led research team uncovers how a very low calorie diet can rapidly reverse type 2 diabetes in animal models. If confirmed in people, the insight provides potential new drug targets for treating this common chronic disease, said the researchers.